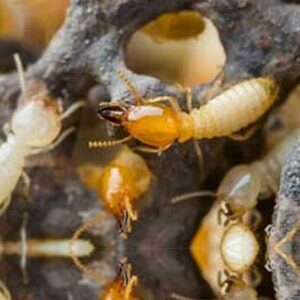 Termite colonies on your property are controlled and destroyed with our Advanced Termite Bait System. It is a pretty unique and simple concept. The termite bait and monitors are like a plastic tube approx 8″ long with a bunch of holes in it. Inside the station is basically a piece of wood with a special attractant in it. 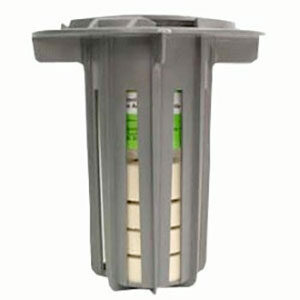 (This will not attract termites from neighboring properties) The stations are inserted into the soil approx every 8 – 10′ around the structure. As Termites forage through the soil in search of a new food source they eventually come in contact with the monitor stations. (This can take a day to happen or years, depending on the size and amount of colonies on the property. Approx. 10 colonies per acre.) Once they start feeding on the monitors we switch it with a “BAIT” or poison that the Termites feed on take back to the colonies. After feeding for a period of time the termites will actually destroy themselves, thus eliminating colonies on your property. We have a ton of success using this system, although we don’t recommend it as a stand alone treatment if you have an actual active infestation in your home. WHY? 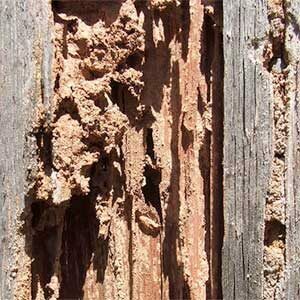 Termites can do a tremendous amount of damage in a season and Termite baiting can take a while. We wouldn’t risk it on our own homes so we don’t recommend it as a stand alone “Treatment”. If you do have an active infestation we suggest you have us come out and provide you with a free inspection and evaluation.